Freshly baked and glazed to perfection right here in Sweet n Savory Cafe's bakery! 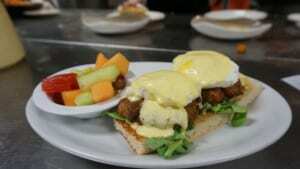 If you’re looking for one of the best breakfast restaurants in Wilmington, then head out for a Sweet n Savory Breakfast. Once you come in to discover all the savory and sweet dishes we have to offer you will be saying this is the best breakfast near me! With the largest breakfast menu selection (see below) in Wilmington to choose from you and all your family will have something to enjoy, no matter how picky that special someone is. Every day your breakfast here at Sweet n Savory can be unique with daily fresh blackboard specials every day. We take call ahead seating for large parties and our brunch service. Our hand cracked four egg omelets are all prepared to order with freshly cooked ingredients with melted cheese inside and out. A true classic culinary delight for every egg lover! Served with your choice of hash browns, stone ground grits or fresh cut fruit these breakfast dishes are sure to satisfy the hungriest breakfast eater in the morning. We look forward to feeding you a amazing egg breakfast, just the way you love it. Did your mom ever make you a breakfast bowl when you were a kid? Our breakfast bowls are made with just as much love and care and with the added touch of our chef’s creative flavor combinations. Looking for a Mexicana spiced bowl or just bacon, sausage and country ham to fill up your breakfast morning? We got it! Don’t miss out on our vegetarian breakfast bowl with spinach, mushrooms, onions and more. These breakfast sandwiches are from our original breakfast menu dating back to a time before SNS officially did breakfast. For the first decade of existence SNS was known to the locals as a bakery and lunch spot, but that all changed when we added these delicious breakfast sandwiches. All the breakfast sandwiches come with your choice of hash browns, stone ground grits or fresh cut fruit. We look forward to seeing you enjoy your breakfast with us Wilmington! We love eggs benedict so much we created an entire section for your gastronomic breakfast enjoyment. Just live in the Cape Fear region with Wilmington, Wrightsville Beach or even Pleasure Island and you will start to love Sweet n Savory as your go to spot for breakfast near me, even if it’s a 20-minute drive. These dishes are just that good! The common theme is our truly classic hollandaise sauce made fresh, made constantly, made in small batches throughout breakfast and brunch. All our Benedict plates come with your choice of hash browns, stone ground grits or fresh cut fruit.